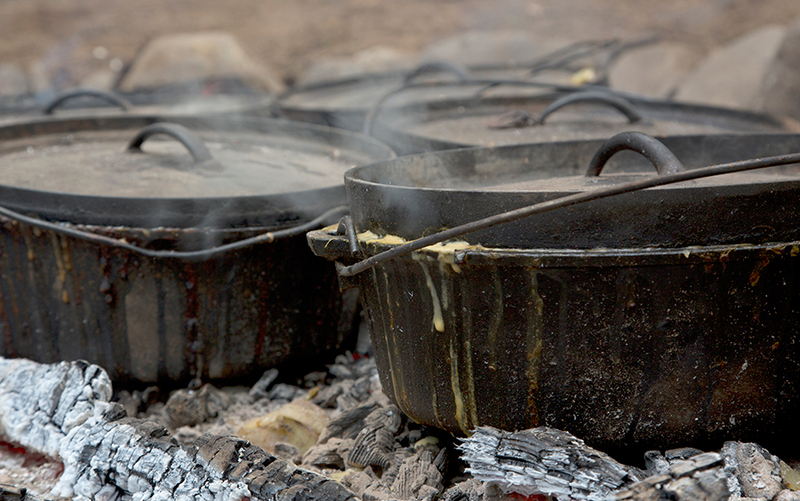 A campsite primer for cast-iron cooking. 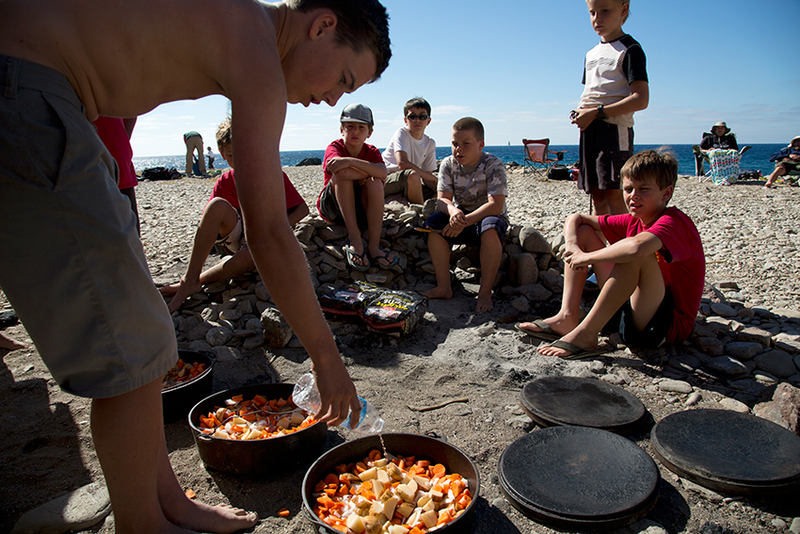 Welcome to the world of Dutch oven cooking. Whether you’ve cooked with one for years or just want to try it for the first time, we’ve designed this guide with you in mind. 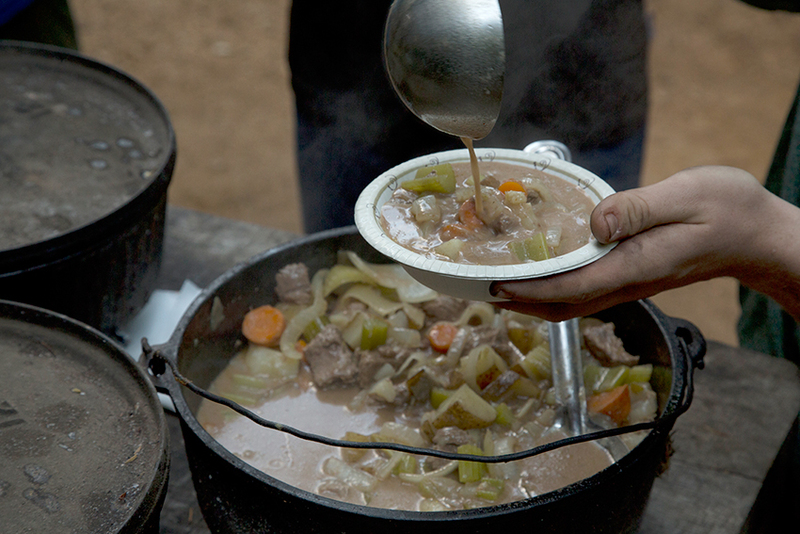 You’ll need a Dutch oven and an appreciation for good food. Other folks swear by aluminum. They’re lighter, don’t rust and require fewer coals. But they can develop hot spots and lose heat faster. And food tends to stick. 1.Wash the pot and lid in warm, soapy water — this is the only time you’ll use soap in your oven. 3. Thoroughly rub the pot and lid with a thin layer of shortening, lard, olive oil or cast-iron conditioner. Do not use butter or margarine. Note: If you’re careful, you also can use your kitchen oven for the seasoning process. But you might set off your fire alarm. Place aluminum foil or a cookie sheet on the bottom rack to catch any drips. Bake the Dutch oven at 400 degrees for one hour. Turn off the heat and allow the Dutch oven to cool down as your kitchen oven cools. Take the diameter of the oven (12 inches, for example) and subtract three (12 – 3 = 9) for the number of coals to place below the oven and add three (12 + 3 = 15) for the number of coals to place on the lid. This creates a temperature of about 325 degrees. Watch out when you lift the lid to check your food. I’ve seen many a dish spiced with “camp pepper” (ash) when folks try to lift the lid with a claw hammer, pliers, or some kind of fancy lever. The best lid lifter ever invented is the Mair Dutch Oven Lifter. It gives you control of the lid like it was your bare hand. When all food has been cleaned from the oven, wipe it dry and place on a gas stove or other heat source to thoroughly dry out the pores. I wipe a thin layer of cast-iron conditioner, olive oil etc., on my ovens after I dry them. Some other cooks do not. Just remember: If you keep the oven dry, it won’t rust. H. Kent Rappleye, past president of the International Dutch Oven Society, is an Eagle Scout and Vigil Honor member of the Order of the Arrow. A former Scoutmaster, Varsity coach and commissioner, he has three sons who are Eagle Scouts.